After a successful two years in business, entertainment company Xtreme Sports is set to expand again with the opening of its Fun Zone. 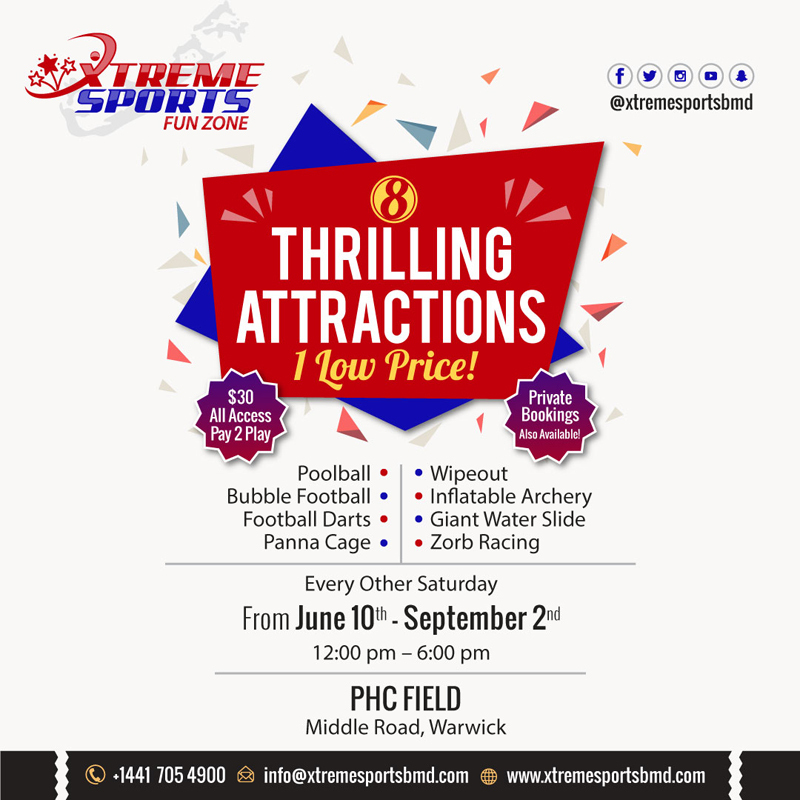 With the focus of providing Bermudian families with something new and exciting to experience, the Xtreme Sports Fun Zone will be open every other Saturday from June 10th – September 2nd, to be held at PHC Field in Warwick, from 12:00pm to 6:00pm. “I’m very pleased that the company has been able to create jobs and help stimulate the economy. We’ve just hired 30 summer students to help run the Fun Zone, and it’s a great feeling know that the company is providing job opportunities for our young Bermudians,” Waldron said. “Some of the attractions that will be featured in the Fun Zone are bubble football, zorb racing, wipeout, and a giant water slide. “It’s a good mix of games and activities, and they can be enjoyed by all ages. ‘All-Access Pay to Play’ passes are $30 per person, which allows guests to play all of the games and activities an unlimited number of times. Admission is free for those who are only spectating. “Group rates and packages for birthday parties and large groups are also available. All-Access passes and packages can be purchased online or at the gate. More information is available here.